This the ‘Stigma Chakra’. It’s something Hans developed to illustrate what we see on the DISHA project time and time again. People are ignorant about HIV. What it is, how it’s transmitted, how to get tested, what it means to be HIV positive, what treatment options are available and so on. No one should be complacent: this lack of knowledge is NOT limited to India. But the ignorance makes people fearful, leading to huge stigma surrounding the virus. 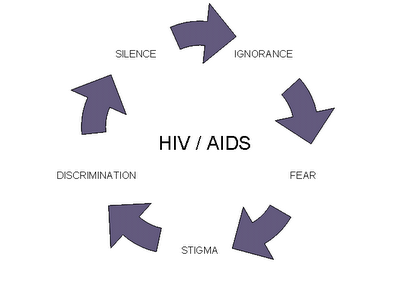 When people encounter someone who is HIV positive, they react with discrimination. This leads to silence: why would you come forward if you might be shunned by your friends and family? People who suspect they may be HIV positive are reluctant to come and get tested. If they do find out they’re HIV positive, they may be reluctant to tell anyone about it. As a result, they may run the risk of spreading the infection to their partner/s. People living with HIV (PLHIV) often fail to seek medical help when they need it. Time and again, they won’t come forward until they’re at HIV stage IV, clinically known as AIDS. By this stage – needlessly! – it’s too late. Yet by living healthily, treating opportunistic infections promptly and by following a regime of antiretroviral therapy, people can live with HIV for years. It is a chronic treatable condition, like diabetes. But whereas people can live with HIV, AIDS is fatal. This reinforces the stereotype that HIV equals death… which leads to fear, leading to stigma… leading to discrimination… and so it goes on. The key is to break the cycle. The enemy of ignorance is knowledge. Make people aware, and you can remove the fear. And the stigma, and the discrimination, and the silence.